The inaugural Lilyroo Ride was a 1156km 7-day charity bicycle tour from Women’s and Children’s Hospital, Adelaide to the Royal Women’s Hospital, Melbourne. The tour took place from Sunday 5th April 2015 to Saturday 11th April 2015 and raised much needed funds for the Royal Women’s Hospital NISC unit. Twenty riders rode from Adelaide to Melbourne supported by nine fantastic volunteers. Together they raised an incredible $127,793. 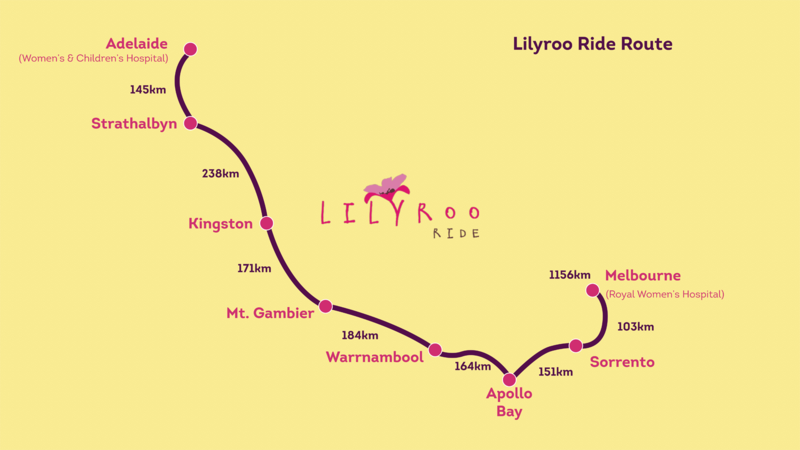 Meet the amazing people who made the 2015 Lilyroo Ride the success it was here. The ride navigated the coastline along the south of Australia between Adelaide and Melbourne travelling through McLaren Vale, Coorong National Park, the Great Ocean Road and Mornington Peninsula.